Look ahead to the most exciting new book releases coming in the world of sci fi and fantasy this year. From hugely anticipated fantasy debuts to continuing adventures in science fiction’s most popular universes, there’s a lot to look forward in the world of sci fi and fantasy books this year. 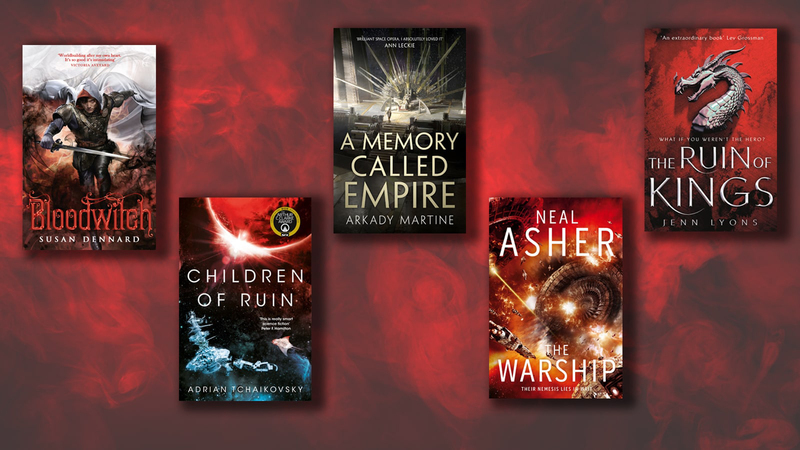 New year, new you - and most importantly new science fiction and fantasy. It will be fascinating to see which trends emerge and how quickly, and if the predictions we made on our Best of 2018 podcast episode are proven right. Either way, let’s take a look at some of the titles we can’t wait to get our hands on. Susan Dennard’s Witchlands series has gone from strength to strength. Windwitch and Truthwitch were both excellent and foreshadowed a ton of character lore and plot details that Bloodwitch will explore. Existing fans won’t need much persuading to be very excited for the next instalment in the series. If you're new to the series, check out our introduction to the Witchlands series here. Yoon Ha Lee’s Machineries of Empire trilogy was lyrical, imaginative military science fiction. So Dragon Pearl, a YA space opera based on Korean folklore, is a change of pace. The novel tells the tale of Min, a human from a family imbued with fox-magic and able to shape-shift (although this is forbidden, in order to avoid raising suspicion). Tired of her daily routine and unexciting planet, she yearns to follow her brother into the Space Forces, and to see the Thousand Worlds. Highly recommended for younger readers, but frankly enjoyable whatever your age. Jenn Lyon’s debut is the first of a brand new series entitled A Chorus of Dragons. It’s one of those fantasy novels that is brim-full of big ideas – body-swapping, prophecy, rich worldbuilding and grim commentaries on many aspects of empire – to name but a few. This tale of Kihrin, a young prince cursed with bad luck and worse prophecy, is fantastically complex and multi-layered. Characters like Doc and Galen, Kihrin’s own well-balanced set of talents and flaws, and some innovative narration techniques make for a strong start to a promising series. We discussed The Poppy War by R.F Kuang in the Best of 2018: Science Fiction and Fantasy blog, so it’s little surprise that we’re chomping at the bit for the follow up. Expect copious amounts of opium, vengeful gods, traitorous rulers and a deepening of protagonist Rin’s compelling moral complexity – and powers. Even more of the same would be amazing, but The Dragon Republic essentially sees Rin go rogue, which opens up so many more possibilities. This is fast opening up into one of the best fantasy series of recent years. Arkady Martine’s debut is something for fans of Asimov, Simmons, Leckie et al to get really excited about. You’re in at the deep end from the opening pages in the best possible way. One thing is for certain: the Teixcalaan Empire seems enormous, and due for a fall. There are definitely parallels to Leckie’s Ancillary Justice or Seth Dickinson’s The Traitor in that set up, but Martine’s voice is unique. It helps that her universe-building places one of the most fascinating themes possible at the very centre of the pan-galactic stage. This is the ‘memory’ mentioned in the title. Martine creates a technology by which a select few can carry their predecessors in their minds, so they may take advantage of their wisdom and memories. But this is hidden, a dangerous secret. Discovering the way in which this works - or doesn’t – is one of the biggest pleasures of the book. All told this is a political space opera of the highest order and an astonishing debut. 2018 saw Neal Asher return to his Polity Universe for a new trilogy, Rise of the Jain. His follow-up, The Warship, sees protagonist Orlandine facing a new threat, [SPOILERS] following her defeat of the Jain super-soldier. Rebel forces on her home world plan her assassination; tensions between Earth Central and the crab-like Prador intensify; the alien accretion disk contains yet more mystery. Something tells us it won’t be resolved over tea. Asher’s trademark interstellar politics and exotic, military-alien warfare are back in full force. The Warship raises the stakes and sets the stage for a universe-shaking finale. Following on from Tchaikovsky’s Arthur C. Clarke Award-winning novel, Children of Time, Children of Ruin finds modern humanity dealing with the consequences of Earth’s ancient empire building. A terraforming program transforms the world of Nod, with unplanned and ominous side effects. Aeons later, an exploration mission finally discovers this part of space. They are hoping to find cousins from old Earth, but realise that something else entirely awaits. We had Adrian on the show a while ago to discuss how he makes really alien aliens and his hopes for the series – so get yourself acquainted. Children of Ruin is evolutionary science fiction of the absolute highest order.